It's a marriage made in heaven--or hell, depending on which side of the bottom-line you fall: cocky, high-strung celebrity actor Josh Penner works as a secret agent for the CIA, gathering intelligence on every tin-pot dictator and megalomaniac the Third World has to offer. His liaison, the weathered OCD-suffering Charles Mulberry, works out of the Foreign Research Division in LA. His strategy, as they meet surreptitiously at hot dog carts and hotels from Oxnard to Beverly Hills, is to inflate the already colossal ego of Penner as he tackles new assignments. His latest one--making contact with Tom Richardson, an ex-spy who's written a memoir that's potentially embarrassing to the CIA--puts him on the path of retrieving the manuscript so the agency can perform their usual damage control. As Penner sets out on his appointed task, there's the issue of American interest in the respective health problems of Venezuelan President Hugo Chavez and Cuba President Fidel Castro; Russian agent Igor Kuntevich sets out to liquidate some French competition; and Jennifer Jones, agent from the FBI, starts hovering over Penner's clumsy attempts at espionage. The FBI doesn't appreciate interlopers like him when it comes to ferreting out intelligence that might further their own fortune as an agency. 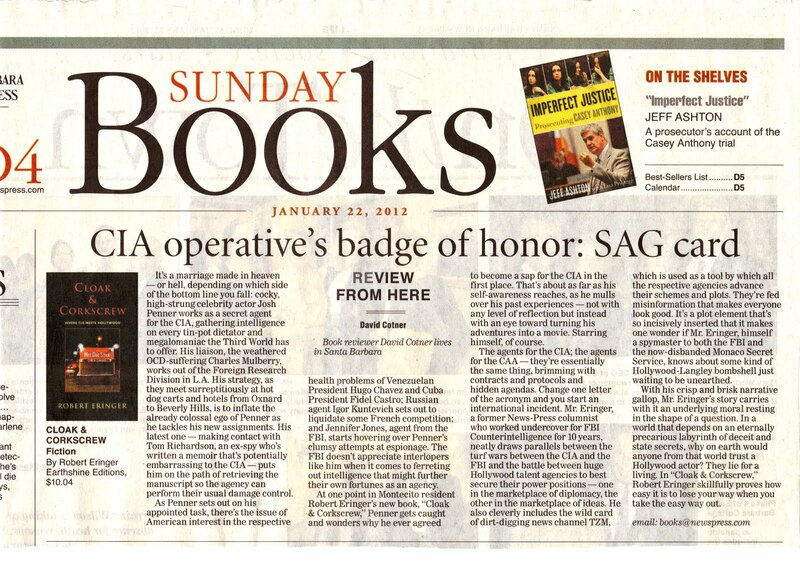 At one point in Montecito resident Robert Eringer's new book, "Cloak & Corkscrew," Penner gets caught and wonders why he ever agreed to become a sap for the CIA in the first place. That's about as far as his self-awareness reaches, as he mulls over his past experiences--not with any level of reflection but instead with an eye toward turning his adventures into a movie. Starring himself, of course. The agents for the CIA; the agents for the CAA--they're essentially the same thing, brimming with contracts and protocols and hidden agendas. Change one letter of the acronym and you start an international incident. Mr. Eringer, a former News-Press columnist who worked undercover for FBI Counterintelligence for 10 years draws parallels between the turf wars between the CIA and the FBI and the battle between huge Hollywood talent agencies to best secure their power positions--one in the marketplace of diplomacy, the other in the marketplace of ideas. He also cleverly includes the wild card of dirt-digging news channel TZM, which is used as a tool by which all the respective agencies advance their schemes and plots. They're fed misinformation that makes everyone look good.. It's a plot element that's so incisively inserted that it makes one wonder if Mr. Eringer, himself a spymaster to both the FBI and the now-disbanded Monaco Secret Service, knows about some kind of bombshell just waiting to be unearthed. With his crisp and brisk narrative gallop, Mr. Eringer's story carries with it an underlying moral resting in the shape of a question. In a world that depends on an eternally precarious labyrinth of deceit and state secrets, why on earth would anyone from that world trust a Hollywood actor? They lie for a living. In "Cloak & Corkscrew," RobertEringer skillfully proves how easy it is to lose your way when you take the easy way out.